The new Topdeck is the base for all the new flex options. 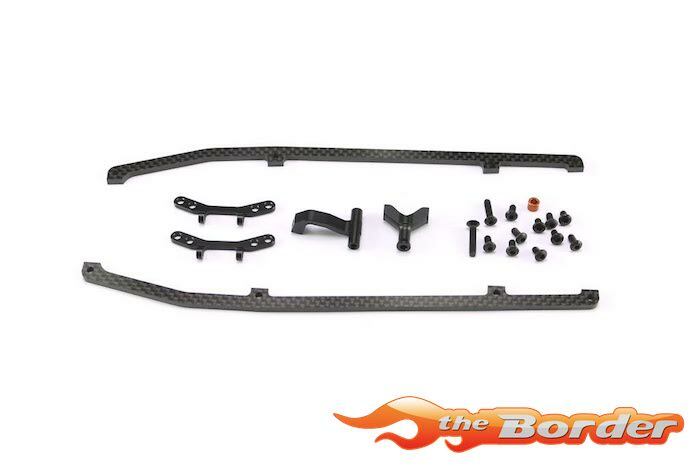 It consists of two equal shaped vertical oriented 2.5mm carbon fibre plates. The plates are connected to the front and rear suspension with a machined aluminium adaptor plate. Unlike flat topdecks, the vertical oriented double topdeck still allows a lot of linear torsional flex, but basically eliminates any longitudinal tweaking and reduces torsional tweak drastically. It can be run in addition to the kit aluminium center stiffener. The H-shaped stiffener plate can be removed when the topdeck is used to create more flex in the front and rear section of the car.